WEBCON BPS 2016 introduced major changes in the Show Workflow Elements Web Part. A new, faster configuration interface was implemented allowing the creation of complex reports with intricate filters in an intuitive way. In comparison to WEBCON BPS 8.3, a number of new features were added such as a link-type calculated columns or an improved text-searching mechanism. This article outlines methods of creating SWE reports, as well as solutions allowing them to filter and personalize the results. A couple of new features introduced WEBCON BPS 2016 are also mentioned. Be sure to check out the SWE video! The new configuration screen is much more intuitive and easy to read. The single configuration screen has been discarded in favor of tabs which are much more ergonomic, the menu is now separate from the main configuration segment allowing for faster switching between tabs. It’s also worth noting that choosing another tab doesn’t refresh the site. The following examples are based on the default process included in every fresh installation of the WEBCON BPS. The first step in configuring your SWE report is setting up the filters. 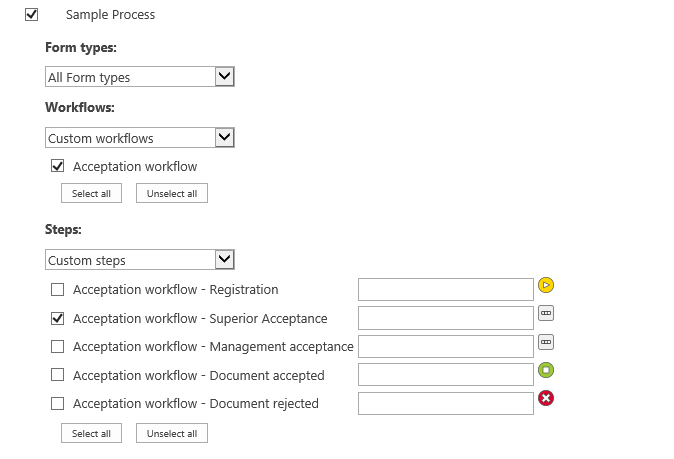 Here it is possible to define from which process, workflow, and form type data will be shown. An example can be found below. 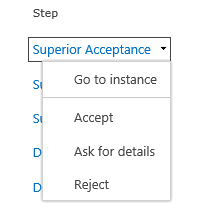 In this case, the SWE report will display instances of the ‘Acceptation workflow’ that are currently residing in the ‘Superior Acceptance’ step. This tab is used for configuring a standard filter with limited knowledge of SQL. Adding subsequent filters is done by clicking “Add”, choosing the form field and conditions. A sample configuration is shown in the screenshot below – the report will present software orders above 150 PLN. Remember to save the entered data. Row filters where parameters are associated with the creation/modification time of the instance. Filters defined as a hyperlink parameter are an interesting way of displaying data. They are very useful when we are dealing with an SWE report and we want to display it in various ways using pre-prepared links. The configuration boils down to specifying the name of the parameter which will be used in the hyperlink, and a form field to which it will refer. Of course, it is possible to define multiple filters. For example, to refer to the defined filter shown above, enter: ?kat=VALUE. After invoking this hyperlink, the workflow instances containing a value in the “Category” field will appear in the report. It is possible to use many filters forced in the URL parameter. In that case, they need to be separated by the & sign. Using SQL filters requires basic knowledge about the construction and mechanics of SQL queries. After saving, the whole SWE configuration is translated into an SQL query which is then executed whenever it is displayed. It is possible to enter further SQL conditions after the AND keyword. Below is an example of this kind of configuration. It will pick only the instances which were registered on the previous working day. This is, of course, only one of many possible uses. „Data selection” tab is the most important section of an SWE configuration. In this tab, we can choose columns which will be included in the report. Please note that the form fields appear only if one process is selected in the standard filters. In any other case, you’ll be able to choose system and global fields only. Field – defines which fields should be included in the report. No. – sets the order of columns (starting from the left). Column header – changes the name of the form field in the SWE report. This option is useful when the name is too long. For multi-language systems, it is possible to enter alternative translations. 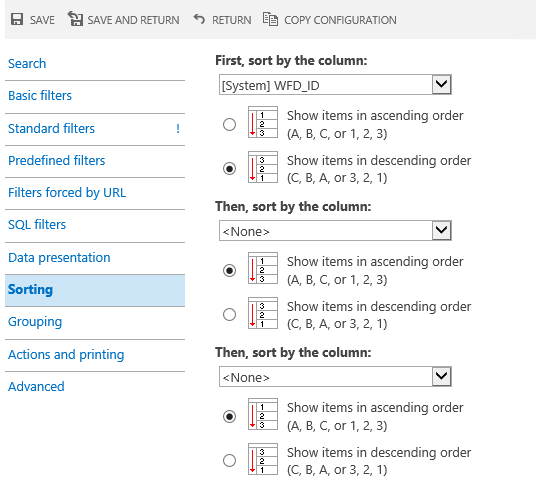 Filtering – when selected, this specific column in the report will have the functionality of filtering results. Link – when selected, data in this column is displayed as a link to the relevant instance. 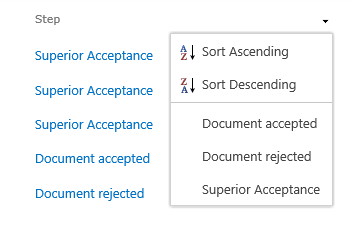 Path transition menu – this function allows the instance to be transitioned to next steps directly from the SWE – its available paths can be seen in the drop-down. Column width – defines the width of the column. If left empty, it will be automatically adjusted. Display options – only available for “Multiple lines of text” type fields. The first 100/200/300 characters of the given field will be displayed on the report. Basic/Advanced search – when selected, the search engine includes the values of the selected column in the search. 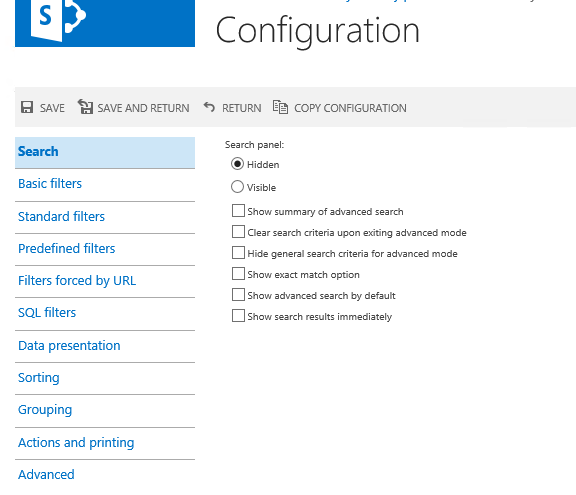 Further configuration of search options is available in the “Search” tab. Search options – for date and choice field type form fields, it is possible to define additional search settings. Summary options – for columns that contain numbers, it is possible to display a summary at the bottom which can be either the sum or the average of all values in the column. Calculated columns – configure queries for calculated columns (or remove them). In a fresh Web Part, sorting is active on the ID column by default. It is not a problem to modify these settings and sort by any system field or form field. Rows may be sorted by three selected columns. Display order can be ascending or descending. Grouping the instances can make them more interesting and more appealing to the end-user. In a couple of simple steps, it is possible to increase the clarity of an otherwise cluttered report that contains a lot of data. One possible idea is grouping by system column “step” and “signature”. The end result is that the end-user will get a report which clearly shows all the instances grouped together depending on which step they are in. In this case, it is also possible to group the instances by any system field or form field. Additional options make it possible to overwrite the header or expand all groups by default when displaying the SWE. The simplicity of configuration and a multitude of options make Show Workflow Elements Web Part an integral and flexible part of the WEBCON BPS system. Thoughtfully configured reports are a massive boon for end-users working in the system. The power-user can easily prepare a complex report that is well suited to the expectations of the target audience. The most beneficial aspect of a Show Workflow Element report is that preparing one doesn’t require advanced technical knowledge or extensive experience. This solution is an interesting alternative to complicated and time-consuming SQL Server Reporting Services (SSRS).